When the time comes for building a new fence that offers privacy and longevity, a solid metal privacy fence is the perfect fit. 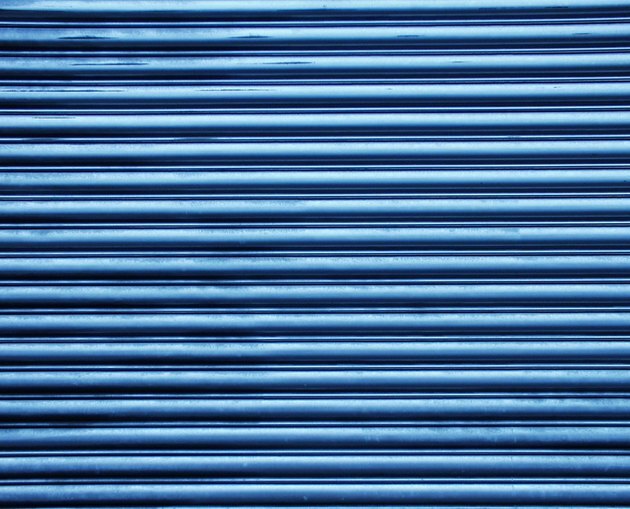 Using inexpensive corrugated metal for the fence allows you to size the fence as needed, affording you the opportunity to surround your property without overspending in the process. The corrugated panels are simple enough to construct that no specialized training is required, and are made to last for years even in extreme weather conditions. With an added wooden frame around the panels, the sharp panel edges are concealed and the fence looks acceptable enough for even residential use. Create solid metal privacy fences with a few corrugated metal panels. Set up a laser level along the fence line. Use the laser serve as a guide for marking the fence line onto the ground with landscaping paint. Measure the length of the painted line with a tape measure. Divide the length by 4 feet and round the result up to determine the number of metal panels needed for the line. Purchase two or three extra panels in case of installation difficulties. Make marks along the fence line every 4 feet for the placement of the supporting fence posts. Check with a building inspector to find out how deep you need to place the fence posts in your area. Generally, posts are placed so that the base extends below the frost line for the area to prevent heaves from occurring during winter months. Dig a post hole using a post hole digger at each of the marked locations to the recommended depth plus 6 inches to allow for a layer of gravel. Make your holes 6 inches in diameter. Fill the base of the hole with a 6-inch layer of gravel to assist in drainage. Fill the post hole about 3/4 full with the quick-set concrete. Mix the concrete in a wheelbarrow at the fence line, using a spade to incorporate the water into the mixture and to shovel the concrete into the post hole. Place the post into the hole and make any adjustments to position it so that it's plumb. Use posts that are 8 feet long plus the depth of your post hole above the layer of gravel. You can check that its level vertically using a carpenter's level placed against the pole's side. Fill the rest of the hole with concrete, overflowing it slightly by about 1 inch. Slope this last inch downward and away from the post body to help with water flow away from the post. Brace the posts into place by tying three strings around the post and then extending the strings to three sides with equal space between them. Attach the other ends of the strings to wooden stakes and drive the stakes into the ground to hold the posts in position. Wait about 4 hours for the concrete to cure around the base of the posts. Cut frames for the corrugated panels using 2-by-4-inch planks. Cut two of the planks to match the panel length and two to match the width. Use a 45-degree mitered cut from the outside edge of the plank to the inside so that they fit around the edge of the corrugated panel like a frame. Cut a groove in the center of the planks with a router, making the grooves 1/2-inch deep and as wide as the depth of the side of the panel that you're attaching the plank onto. Paint the planks with an exterior latex paint the color desired using a paintbrush. Paint a layer of galvanized paint onto the metal panels to give them a layer of protection against the weather. Allow the paint 6 hours drying time. Place the frame pieces around the panels and secure them in place with galvanized screws through the wood and into the corrugated panels. Place the framed panels against the posts and screw them into place with the galvanized screws.